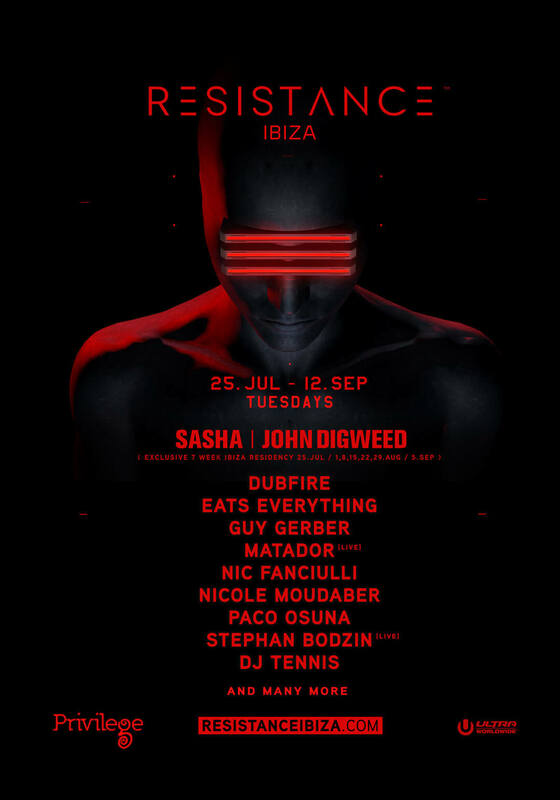 Having already confirmed British legends Sasha & John Digweed as its exclusive island residents, RESISTANCE™ has now added eight more huge names to the proceedings this summer, in the form of Dubfire, Eats Everything, Guy Gerber, Matador (Live), Nic Fanciulli, Nicole Moudaber, Paco Osuna, Stephan Bodzin (Live) and DJ Tennis. The brand’s first official foray onto the White Isle, RESISTANCE™ will run every Tuesday at Privilege Ibiza from July 25 until the official closing party on September 12, with Sasha and John Digweed leading the charge at seven of those eight dates (25 Jul / 1, 8, 15, 22, 29 Aug / 5 Sep). With many more names to be announced soon, tickets for all eight events are now on sale at ResistanceIbiza.com. Stay tuned to RESISTANCE socials for all further information.